The Roan antelope is notably among the large antelope species that is exceeded in bovines by the African Buffalo and eland measuring 190–240 cm stretching from the head to the tail base while the tail alone measures 37–48 cm. 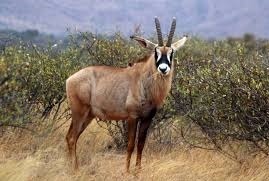 The male Roan Antelope weighs about 242 – 300kg while the female Roan Antelopes carry 223–280 kg as their body weight. The Roan Antelope Species shoulder stands at 130–140 cm and the antelope itself derives its name from the roan color of its coat that appears reddish brown. Their underbellies is lighter, the eye brows are white while the face is black though darker in males than females. The Roan Antelopes always encountered on Uganda safaris feature erect mane that appear short, light beards and protruding nostrils. The Roan Antelopes feature ringed horns extending to 1m in length in the male Roans and a bit shorter for the females and these horns curve backwards. Regarding habitat, the Roan antelope is majorly found in woodland habitat along with grassland savannah which greatly exist in the savannahs, sub-tropical and tropical grasslands, shrub lands biome that range in density of trees from the forest featuring grassy understorey like the central Zambezian Miombo woodlands stretching to grasslands that are marked with few tree counts where the Roan antelopes consider mid length grasses. It can be noted that they like feeding on grass but would at times consume shrubs, acacia tree pods and herbs. They like drinking and thus would thrive in an area where water is within reach. These Uganda safari wildlife Species thrive in harems of 5 – 15 animals that feature a leading male. The Roan antelope tend to fight among themselves for who should dominate in the herd and their fighting involves brandishing their horns while on their knees. The Roan Antelope breed throughout the year but the births tend to be common in the wet season. The mother Roan Antelope would conceal a calf in a tall grass and do not wander far from it. They feature a gestation of about nine (9) months. The life span of a Roan antelope is about 17 years and their main predators include the Spotted Hyenas, the African Leopard, the humans who hunt them both for bush meat and sports and the wild dogs. The Roan Antelopes can run to 35 miles per hour and are listed as least concern under the IUCN red list with the population of about 76,000 remaining in the world. In Uganda, they are found in the country’s north eastern savanna protected area of Kidepo Valley National Park where they can always be encountered by travelers on Uganda safari tours.